Stephen Speers and I explore Jungwon (Fulbright: 1 Year Since) – Habitually Being: thoughts worth living. For those of you who have been following my blog, you know that there is not much to follow. In short, this grant year, I have done horribly at documenting what I have done on this blog. Therefore, I’m starting a new series “Fulbright Korea: 1 year after.” Basically, I’m using TimeHop to post about what I did exactly 1 year before. This works well because while my blog presence was lacking my facebook presence…wasn’t. I facebooked. Oh my, did I facebook…. AND this way you get the added commentary and benefit my hindsight provides. That way you can see how I have revised my own history realized the significance of the events as time has passed. I did update during orientation so this actually overlaps. What I didn’t mention in my post 1 year ago was that on July, 13, 2015, I first really spent with Stephen Speers. Stephen took the photo of me and the knock off-Mickey. Stephen and I are good friends now. We first bonded over realizing we had not left Jungwon at all for 3 days. In fact, I had not spent much time with anyone yet–other than my roommate Abhik. Then, Stephen and I decided to explore. We looked at all the unusual sights around Jungwon. Stephen was particularly fond of the dinosaur statue and life-size jet plane model. He studied education in college so we spoke about teaching some as well. It was impossible not to note how often he mentioned Asheville and North Carolina. I was probably just as bad, if not worse, with my storytelling about Kentucky, Ohio, and my first year teaching. Bryan Betts was there and took some pictures with a pretty nice camera. None of those pictures can be found here. Just as he called the Jungwon statues “The GREATEST” he had ever seen, many of the restaurants we travelled too were the “Best” or “Worst” thing ever (with some more colorful words added in as superlatives. He’s also a very caring friend. While I barely ever use my phone as a phone, just yesterday I called him. We spoke about the frustrations and excitement and oddities of wrapping up the grant year. I sat in a Korean coffee shop in Uiseong. He was on his way to Mom’s touch: New Orleans Style Chicken and Pizza in Gyeongju. And we talked about everything from stingy landlords who wanted him not to use hot water or A/C for his last week to telephone companies which would only allow you to terminated service same day you requested a cancellation (no waiting until the end of the month. It means we’ll be going to the airport with no cell phone service). And, somehow, it seemed a natural end to the beginnings of our friendship marvelling at dinosaur statues in a college town in the middle of South Korea, spending our days in Korean classes, seminars, and school visits wondering what the future would bring. 2nd semester. Stephen and I at a Samsung Lions game on Children’s day. Also, a laudable photo-bomber. I can’t think of a better place to start a friendship. We will still marvelling at tiny differences in culture and things that seemed strange. Still navigating and trying to be good “cultural ambassadors,” but now we were a bit more confident. I had stayed at his apartment in Gyeongju, travelled with him to Vietnam and Thailand (and let him do all the planning), went to my first Korean baseball game, and enjoyed his friendship throughout the year. I laughed with,at, and because of him more times than I can count. I’m grateful for his friendship. But there will be other times to post about that. For now, let me say, it all started on a hot July day in Geosan, July 15th, 2015. 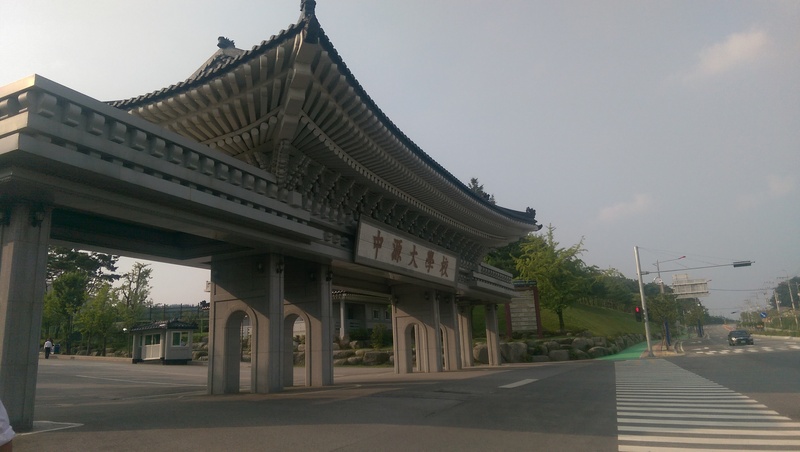 Previous Visiting Gwangju: Mid-term school observation trip report.